Can be connected with smartphone/tablet via Bluetooth, electronic control, HRC program, user programs, WATT program, comfortable seat, transportation wheels. Single-handed plastic 8 kg dumbbell, bell-shaped, cement filling. The Exercise Bike inSPORTline inCondi UB35i II is an electronically controlled exercise bike for home use. It features an easy-to-use display with a variety of functions such as heart rate, calories burned, distance covered, performance (watt) or fitness test (Recovery function). Using the HRC (Heart Rate Control) program, you can personalize your workout. 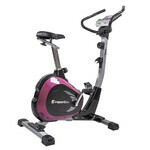 The Exercise Bike inSPORTline inCondi UB35i II has a sturdy structure which provides stability. You may also appreciate the uneven floor adjustment system. The vertically and horizontally adjustable, comfortable seat and anti-slip handles with built-in heart rate sensors allow for a comfortable workout. The front transportation wheels will make it easy for you to move the Exercise Bike inSPORTline inCondi UB35i II from one place to another. 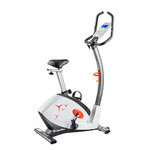 Its elegant design and quality workmanship make this exercise bike a popular piece of workout equipment. Exercise Bike inSPORTline inCondi UB35i II can be connected with Bluetooth to tablets and smartphones with Apple iOS 9.3+ or Android 5.0+ and aplication inSPORTline inCondi. This aplication allows you to viirtually run in Alps, world metropolises and other interesting places. You can track the route through Google Maps and Street View directly on the screen. The application also offers launch, setup, and control of machine functions directly from your mobile device.